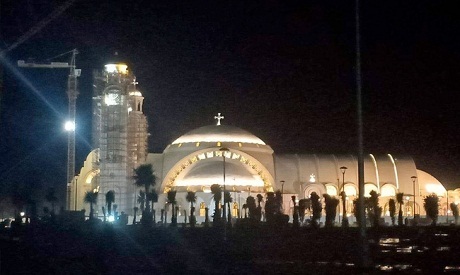 The Coptic Orthodox Church's official spokesperson says that Egypt's new Nativity of the Christ Church, the largest in the Middle East, will officially open on 6 January, where Coptic Christmas mass will be held. The mass will be attended by President Abdel-Fattah El-Sisi and Coptic Orthodox Church Pope Tawadros II. The Church said in a video posted online that the public can attend the mass after registering with the Church. The video also shows parts of President El-Sisi's speech during Christmas Mass at the Cathedral of St Mark in Abbasiya district in January 2018, where he promised that the next Christmas mass would be held at the new cathedral upon its completion in 2019. The Nativity of the Christ Cathedral, built in Egypt's New Administrative Capital, occupies 30 percent of the 4.14 acre site allocated to the complex. The cathedral can accommodate 8,200 worshippers and the complex has been designed around a large central square and includes a papal residence, a reception hall, meeting rooms and offices. President El-Sisi commissioned the building of the Cathedral in January 2017 following twin terrorist attacks that killed at least 27 Coptic Egyptians at St Peter and St Paul’s Church in Cairo on Palm Sunday. During Christmas mass in 2018, the Egyptian president said that the new church is considered "a message of peace love to the world."